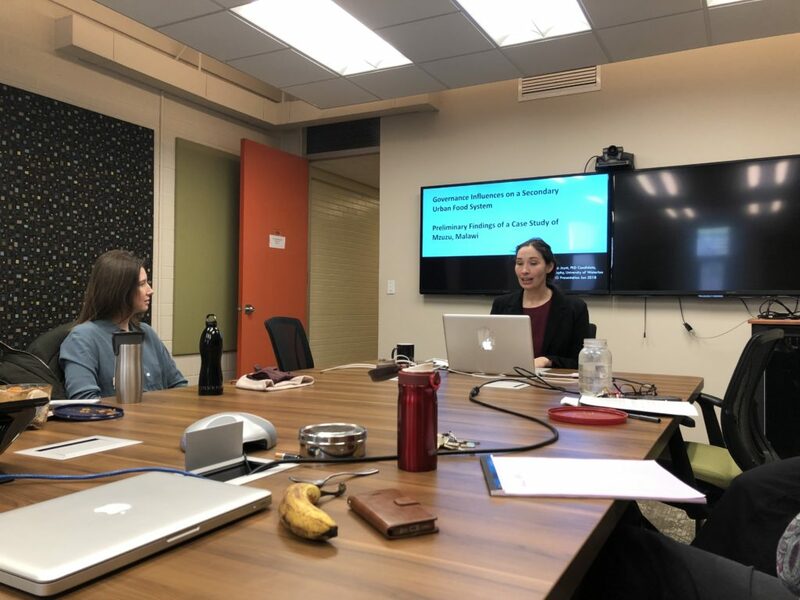 QE Scholar Amanda Joynt presented her PhD research and fieldwork findings at the Waterloo Food Issues Group seminar on January 24th 2019. QE Scholars Mary Caesar, Robert Kinlocke, Zhenzhong Si and Yanick Borel Kamga attended the seminar. The title of the presentation is Governance Influences on a Secondary Urban Food System – Preliminary Findings of a Case Study of Mzuzu, Malawi. Abstract: Ensuring that all residents have sustainable and consistent access to food is a pressing concern in Africa’s rapidly growing secondary cities, yet little attention has been paid to the interconnections among various levels of governance influencing this problem. Different levels of governance can influence urban food systems, such as urban planning strategies from the World Bank, national food policies, regional economic development plans, traditional governing norms, or municipal actions towards food vending. Unfortunately, urban food research has been both neglected (Frayne, Crush & McCordic, 2017) and fragmented (Smith, 1998), resulting in the need for research that provides a framework for understanding the form and functions of urban food systems. This discussion will provide a context for the necessity of this research as well as review the preliminary findings of a case study of a secondary city – Mzuzu, Malawi The research applies the Governance Analytical Framework to understand the impact of multiple governance structures on the urban food system of Mzuzu, Malawi. This work aims to contribute to academic understandings of food governance, as well as evaluate a method that could move urban food governance studies away from a reliance on disjointed case studies towards a more comparative approach.